To add a blackout date to the calendar, click on the day on the calendar you want to add a blackout date to. On the Add Blackout Dates pop-up the Start Date is automatically populated. 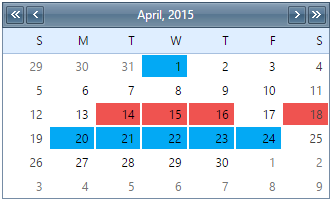 Click the Calendar icon to select the End Date or enter it manually. This date can be the same as the start date or a date in the future. Using a different End Date than the Start Date highlights multiple days on the calendar. To remove a blackout date, click on the existing blackout date on the calendar, which displays the Remove Blackout Date pop-up. Click the Ok button to remove that blackout date. This only removes the blackout date from the selected day. Blackout dates that were set up using multiple days need to be removed individually.